Android phone need a sound card to monitor. Apple phones and computers do not need sound cards. High quality capacitor head. Has three characteristics: anti-noise, anti-rust, anti-saliva.360°Clear to capture sound lines, Pure metal shell, triple noise reduction process. Four-channel noise reduction process, filter the environment noise, reduce current noise, as if exposure to the music world. Real-time monitoring function:When you sing, you can hear your voice and master the tone. But should pay attention to, Android need to sound card can be monitored, Apple phones and computers do not need sound card. The microphone is fully compatible: Android phone,iPhone,computer,Tablet PC. It is compatible with a variety of devices. 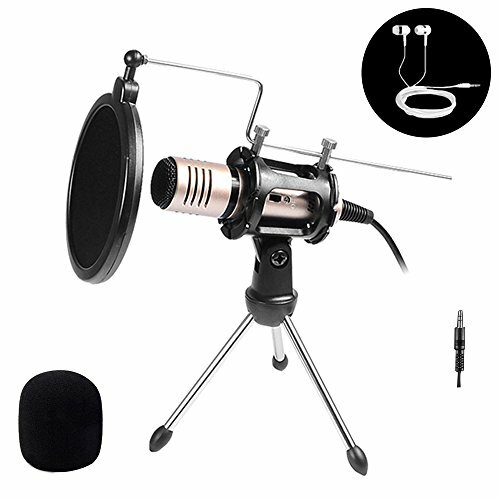 It can be applied to a variety of places: Hostel party, outdoor party, office and home.You can entertain with friends.It can be used for cell phone karaoke, entertainment singing, music recording, video games. Packing specifications: microphone, headset, triangular bracket, cable. Easy to install and easy to operate. If you have any questions about this product by KeWalker, contact us by completing and submitting the form below. If you are looking for a specif part number, please include it with your message.